Sally is talking about rigorous historical thinking in the mixed ability classroom. We start by thinking about the challenges and the joys of mixed ability. Sally says she spent so much time doing different activities and differentiated sheets that she lost what she loved: whole class teaching. She then offers some strategies that have worked in her context that we might find adaptable to our situations. Sally references Berger, saying that after she read Ethic of Excellence she started to question whether she really had the highest expectations of her students. 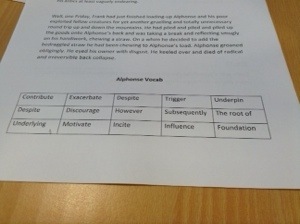 She started by insisting that work was only handed in when it was the absolute best that the student could do. It was time consuming, and work came in in dribs and drabs, but slowly the quality of the work started to improve. Sally started to show the students an example: the epitome of success for the tasks she was setting, so that students are able to see what they are aiming for. For example when year 9s created political cartoons to show the outbreak of WW2, they looked at some political cartoons from the time to give them an idea of what it might look like. Peer critique can also help with that. Students present their work to each other, which can give the lower ability students some ideas for improving their own work: “Which piece of work did you really like? Why? What can you take from that to add to yours?” Sally also shows a picture of her school wow wall, which has examples of excellent work from across the whole school, as an example of a reward for producing excellent work whilst also modelling expectations and good practice. We move onto hooks. Sally talks about a homework at the start of the British empire: ask students to get opinions from home, and then write them on post it notes to show how different they are. She sets up the students who might not have anybody at home who will have this discussion with them, by asking them to talk to their form tutors or the head teacher. When students realised how different the opinions are, they started to want to know why people felt so differently about this. There was also a helpful article from the local paper about someone who gave back their MBE because they were ashamed of the British Empire. Another type of hook is outrage. We read an extract from Stannard’s Uniqueness as Denial: The Politics of Genocide Scholarship, which contains some unpalatable views on genocide of indigenous peoples, which she uses at the start of the American West course when looking at the Plains Indians. This is timely, as I’m changing the way I teach this unit next year and wanted to start with the Plains conflict. We talk about getting them to find the argument, or start with the words they don’t know, or break it down into different opinions. Sally uses it to show that it is a big, massive debate going on among academic historians, which hooks them in and makes them want to know more so that they can argue. Although they won’t get an exam question “was this genocide?” but they will have done the arguing and have the knowledge to answer what is, in fact, a much easier question. Getting students to ask their own enquiry questions. Why is this good in a mixed ability classroom? We look at a simple map of Europe, North Africa and the Middle East, indicating the Islamic empire in 644, and again by 750. Students are challenged to come up with a list of questions they would ask about the two maps. This was followed up by a series of images, from which students are invited to come up with even more questions. This gives them ownership of the learning, because the best question is taken forward to shape the rest of the enquiry. It also provides excellent training for history study later in their school life, as well as giving them some language that helps them to think. She uses a picture of an eruption, a snowy scene, a wiggly river and a flash flood to encourage students to think about words that can be used to describe change. This moves them forward in the language they are using to develop their analysis. Sally also talks about tentative langue – the hedging words that Richard mentioned this morning and Don mentioned yesterday. She moves in to talk a bit about knowledge. She plays pass the hat, with a hat full of questions to test knowledge passed in huge same way as pass the parcel, accompanied by some relevant music. This encourages students to recap their knowledge to ensure they can answer the question if the hat stops on them. Finally, extended writing. We consider positives and negatives of the writing frame; Sally suggests using card sorts to help students organise facts and topics into essay sections, or causes and consequences. This helps them to structure and plan before they start writing, but doesn’t restrict them to a paragraph plan. This entry was posted in shp14. Bookmark the permalink.